The Olympic Peninsula Wineries and Seven Cedars Casino invite you to compete for the best five-card hand and a prize wine and poker-themed gift basket during the second annual self-guided Tour of Wineries & Poker Run. The event will coincide with Port Angeles’ celebrated Dungeness Crab & Seafood Festival, on Saturday, Oct. 10 and Sunday, Oct. 11 from 11 a.m. – 5 p.m.
New this year, FairWinds Winery and Sorensen Cellars, both located in Port Townsend, will offer a wild card to help players complete their hand. Anyone age 21 and over is welcome to participate in the Run. Begin the run at any of the North Olympic Peninsula’s six artisan wineries located in Port Townsend and Port Angeles; at Seven Cedars Casino in Sequim: or at the Crab Festival’s Wine Garden located on Port Angeles City Pier. Enjoy award-winning locally made wine and pick-up an official Poker Run Card, complete with instructions and a map. Each winery a player visits, in addition to Seven Cedars Casino and the Crab Fest Garden, offers the opportunity to draw a card and have the Poker Run card stamped. A visit to all eight locations provides eight opportunities to draw for the best potential poker hand — but the number of stops a player makes is completely up to him/her. A minimum of five stops required for validation. Each venue will have an official depository for completed cards, and will accept cards until close. The wineries will be open from 11 a.m. to 5 p.m. on Saturday and Sunday, and the Crab Festival Wine Garden from 10 a.m. – 8:30 p.m. on Saturday and from 10 a.m.to 5:00 p.m. on Sunday. Seven Cedars Casino opens at 10 a.m. every day, and will offer the last chance to drop-off completed Poker Run cards at 7 p.m. on Sunday. At the end of the weekend, all Poker Run cards will be gathered and transferred to the casino where the winning hand will be determined. The winner will be notified by phone and email. The Poker Run is free of charge. Wine tasting will be available at all six Olympic Peninsula Wineries throughout the day, and customary tasting fees will apply. Stop by the wine garden on City Pier near Crab Central and sample wines from all six wineries in a single location. Seven Cedars Casino offers evening entertainment including live music. 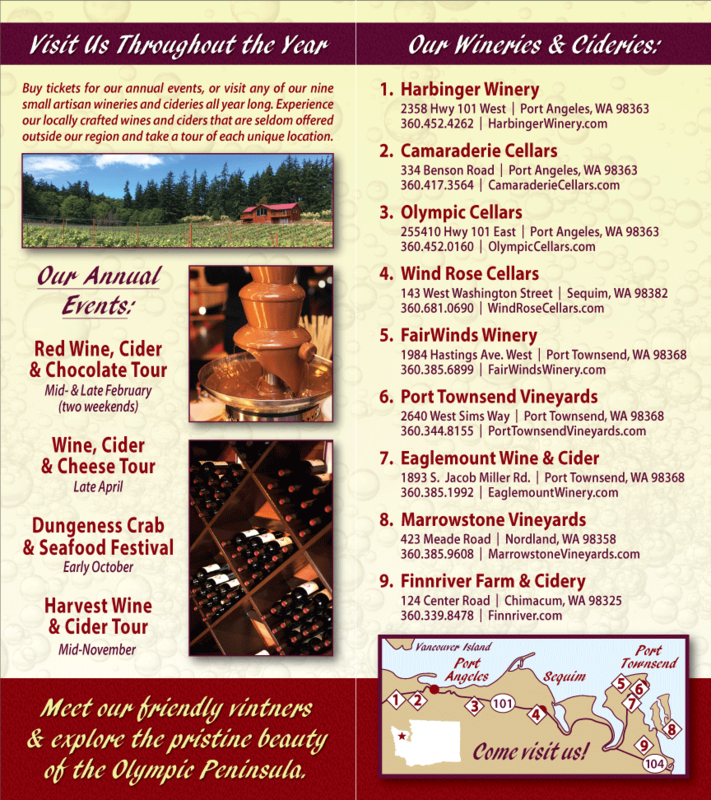 For further information, visit www.olympicpeninsulawineries.org or call 800-785-5495. Stop by and pick up your wild card! Hang around and watch live poker playing or join in on a hand or two – you just might win! See how the wine making process takes place with a winery tour, and sample our own FairWinds Farm tasty potato appetizers. Taste our new release Fireweed Mead as well as six other award-winning wines. www.fairwindswinery.com, 360.385.6899. Visitors can sample the 2007 Viognier, 2008 Townsend Bay Pinot Gris, 2007 Sangiovese, 2006 Cabernet Franc, 2004 Merlot, and 2005 Syrah accompanied by light appetizers. www.sorensencellars.com, 360.379.6416. Are you a gambler or just feeling lucky? Guests at Olympic Cellars can play to “beat” the house “discount.” Most wines will be open for tasting including an expanded reserve list. Taste the grapes off our vines (still too young for wine), ring the Harvest Bell, and pose for the perfect photo opportunity with our new Vineyard Angel by metal artists John and Cynthia Dash. Come and sample our fruit and grape wines, including cranberry, strawberry-rhubarb, raspberry, Syrah and Ridge White. www.blackdiamondwinery.com, 360.457.0748. Featuring our newly released 2007 Tempranillo and a number of other great red wines complemented by “poker party snacks.” Roll the dice at the cash register to determine your purchase discount! www.camaraderiecellars.com, 360.417.3564. Oct. 10 Brew Master Steve Corcoran will be on hand from Noon to 4 p.m. to pour his latest selection of handcrafted beer. www.harbingerwinery.com, 360.452.4262.